Visitors will soon find it much easier to broadcast via AirPlay to their host's Apple TV, thanks to a new AirPlay peer-to-peer discovery and streaming mechanism slated to debut in iOS 8. 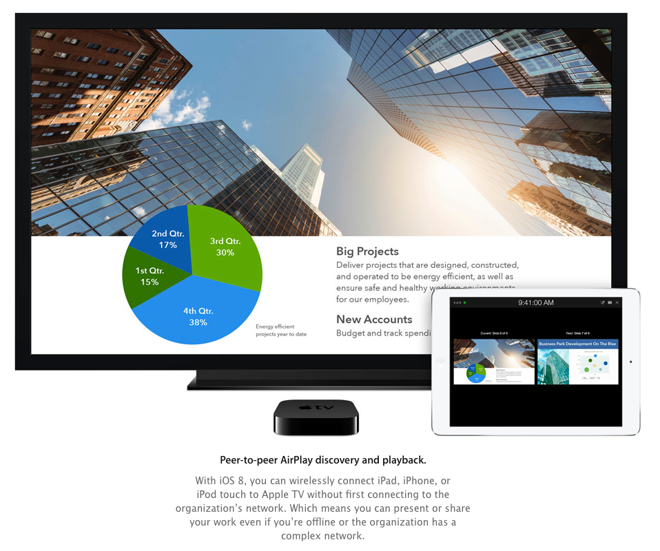 Currently, users need to connect their iOS device or Mac to the same wireless network as the Apple TV in order to use AirPlay. This presents problems when the host doesn't want to —or can't —distribute network credentials, or when the Apple TV is in an enterprise environment with separated networks. With the new system, users will be able to discover and stream to a nearby Apple TV without being connected to a network at all. A presenter could walk into a conference room, for instance, and broadcast to an Apple TV connected to the projector without going through a complex connection process. There is no word on how Apple will handle security in this context, or if the peer-to-peer functionality will be extended to OS X. It's also unclear what the technology is based on, though it's likely similar to the manner in which AirDrop works —device discovery is based on Bluetooth, and a Wi-Fi Direct connection is created for file transfer. Peer-to-peer AirPlay connectivity was first hinted at earlier this year in iOS 7.1, when it was found that iOS devices could substitute Bluetooth for Bonjour when discovering nearby Apple TVs.